Agriculture inspectors found cartons of lamb fat bearing the label “Beit Basar” which were marked as kosher. It was learned the fat came from lamb that was not de-veined, an integral part of the process rendering a kosher animal fit for consumption. The labeling stated otherwise, that the fat came from a de-veined animal slaughtered in accordance to halacha. Pineapple flavored (product code 8855192004181), litchi flavored (product code 8855192004204), passion flower flavored (8855192004198), Mango flavored (8855192004174), are all produced in Thailand. They are marked kosher mehadrin Chug Chatam Sofer Bnei Brak imported with approval of the Chief Rabbinate of Israel. 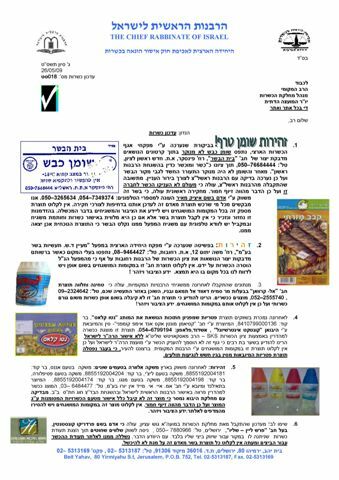 The Gush Etzion Religious Council reports the individual named above is marketing quail meat using a kashrut certificate that is intended for quail eggs, not the meat. The certificate was confiscated and one should not buy products from this individual in the future. Weddings may not be held in this catering facility since it operates on Shabbat and does not have any recognized kashrut supervision. **Active Bar Drinks – kashrut revoked. **HaChi Tov Restaurant – 48 HaNevi’im Street – advertised as kosher without authorization. 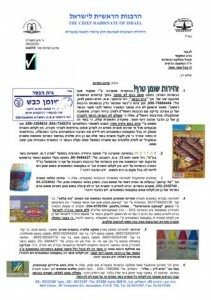 **Salad HaMe’ufaf – Moshav Bet Arif – kashrut revoked due to serious violations. **Kikar Falafel on Smilo Street – kashrut revoked. **Carmeli Bakery – Moshav Arugot – no longer under the local religious council’s supervision. **Yafeh Ta’amim Restaurant – 6 Antikonus St. advertised as glatt kosher but does not have local Rabbanut supervision. **Blei Hafsaka Burekas – Bugrashuv St., corner Ben Yehuda – advertised as kosher without local Rabbanut supervision. **Domino Pizza – 4 Laskov Street – kashrut revoked. **Itstrobal Hall – 2 Yonitzman St. – kashrut revoked. **Muechedet HMO Kiosk – 15 Sprintzak St. – displays a photocopied certificate and does not have local Rabbanut certification. **HaShwarma – Lavinsky St., corner Merchavia – advertised as mehadrin. Does not have local Rabbanut certification. **Metamei Sheharazad – Dizengoff Center – advertises itself as kosher on Thursdays and Fridays by displaying an unauthorized photocopied certificate. Arnon & Anat Bakery located at 62 Yehuda HaMaccabi Street is currently under the supervision of the Tel Aviv Local Rabbinate. The operators of this cruise ship are advertising under the supervision of Rabbi Shalom Tzaddok (http://bihari.biz/kosherholidays/Details_HE.aspx?vacationID=Magic%201-general) from Ganei Hatikvah. The rabbi mentioned is not authorized to grant kashrut certification by the Chief Rabbinate of Israel. The Rabbinate therefore takes no responsibility for the integrity of the kashrut aboard the vessel. Posted on May 27, 2009 by JKN Israel. This entry was posted in 5769 - 2008/2009, Chief Rabbinate Updates. Bookmark the permalink.